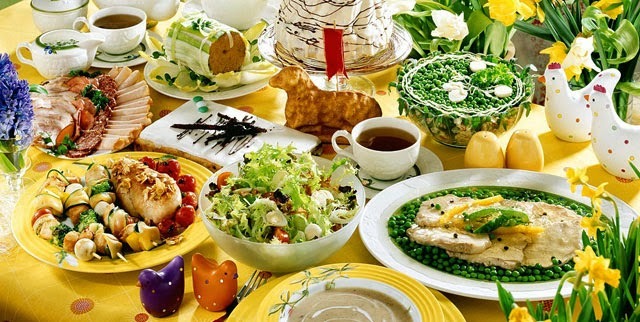 Easter is major holiday in Poland, and Easter celebrations are not limited to Easter Sunday. 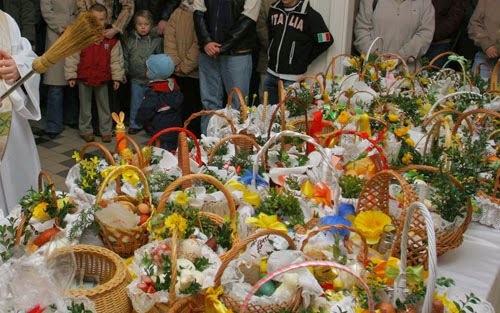 Easter-related traditions take place for more than a week in Poland. From Palm Sunday to Wet Monday, this period is marked with religious rites and practices with their origins in pagan times. It is important to note that Easter in Poland is celebrated according to Western Roman Catholic calendar. Holy Week lasts from Palm Sunday to Easter Sunday. 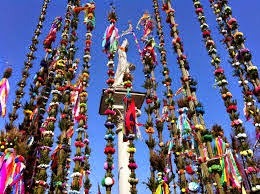 Palm Sunday, the week before Easter Sunday, is marked by church attendance with palm-leaf substitutes in the form of willow branches or handmade bouquets of dried flowers. Some of the Polish villages and small towns organize artificial palm competitions. The most famous one takes place in Lipnica Murowana. In 2013 the biggest palm was over 32 meters high! On Easter Saturday, baskets of Easter food are taken to church to be blessed; the food that is blessed is eaten as a part of the Easter Sunday breakfast (people take to churches a small amount of food like eggs, bread, meat and butter which are put inside the basket) It’s a very important tradition in Polish culture so you can often spot entire families participating in it. 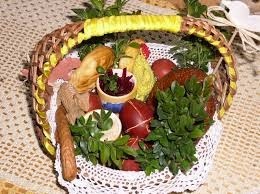 What can we find in a Polish Easter basket?And what do the things symbolise? Butter it is often shaped into a lamb or a cross. This reminds us of the goodness of Christ that we should have toward all things. Easter bread - symbol of Jesus, who is our true Bread of Life. Horseradish with grated red beets - symbol of the Passion of Christ still in our minds but sweetened with some sugar because of the Resurrection. Dyed eggs (decorated with the symbols of Easter, of life, of prosperity) -indicate new life and Christ's Resurrection from the tomb. Sausage- symbol of God's favor and generosity. Ham- symbol of great joy and abundance. Sół- so necessary an element in our physical life, that Jesus used its symbolism: "You are the salt of the earth." Cheese- shaped into a ball, it is the symbol of the moderation Christians should have at all times. A candle is inserted into the basket to represent Christ, the Light of the World. For a decoration people use a colorful ribbons and sometimes sprigs of greenery are attached. A linen cover is drawn over the top and it is ready. Sunday morning in this case means a lot of people attend church. When they get home, the head of the house takes one of the blessed eggs, removes the shell and cuts it into small pieces to share it among all the people in the family. The blessed egg is the symbol of life and eating it is believed to guarantee good health. Everyone exchanges wishes and they eat a big meal that includes the traditional sour rye soup, meat, cold meat, pate, stuffed eggs, and for dessert: babka (sweet yeast cake), cheesecake and mazurek (pastry with a generous layer of chocolate or other kinds of icing decorated with dried fruit, almonds and nuts).As everywhere children love chocolate bunnies, chicks and lambs.Everyone has to eat at least a small piece of each of the blessed foods because this would bring them good luck. 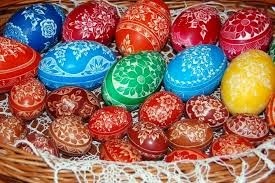 Pisanki are Easter eggs from Poland, handcrafted in traditional designs that recall pagan symbols of fertility and spring. Easter Monday is a family holiday in Poland and is called Smigus Dyngus (also called Smingus-Dyngus), or Wet Monday, after the practice of men and boys pouring water on women and girls. The tradition derives from old pagan customs related to the symbolic awakening of nature and spring cleansing of dirt and illnesses. Girls that were soaked on that day increased their chances of getting married. In many villages in southern Poland, the habit of sprinkling fields with holy water on Easter Monday is still alive. It is often accompanied by tricks played on neighbours, such as changing gates, placing farming tools on roofs or hiding water buckets. 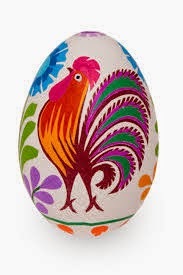 Apart from fun on Easter Monday people in Poland have played ‘cracking eggs’ for centuries. 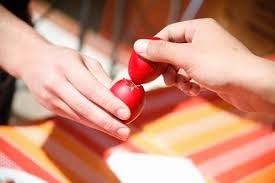 Two people strike Easter eggs held in their palms against each other. The holder of the stronger, uncracked egg is the winner.